The right time to harvest onions is determined to a large extent by their final destination. Working out the right time to harvest onions. The right time to harvest onions depends on their final destination. One of the main factors is if the onions are to be stored or not. Should you want to store them, then leave them to ripen in the ground. See also: Storage systems. With unripe bulb and the plant not yet wilted. This is also called a "green onion" With well-ripened bulbs: they are harvested once 50-70% of the plant is wilted. Almost physically ripe. Bulb is physically totally ripe and at least 70% of the plant is wilted. Direct from field to market, without size grading and with simple packaging. If the price and the market (little demand) allows. Sale after drying and sometimes possibly being graded by size. For markets where size grading is appreciated (and paid for). The onion is harvested once the plant starts to wilt. The onion is harvested once the plant has wilted between 50 and 70%. 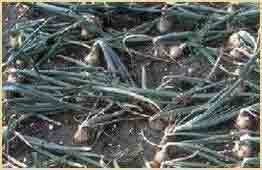 The onion is harvested once the plant has wilted by 90% and the bulb is physically ripe. The onion plant starts to wilt. The moment when the plant wilts is crucial. This field of quality onions is ready to be harvested. At least 95% of the plants have wilted. This is no trick, the plants wilted because the onion is ready. No messing around, forcing the plants down with rollers. That trick damages the onion. It is at this point that the onion has completed its physical development. It will not grow any more leaves, and those that are left will change from green to brownish yellow. The neck of the onion will weaken, and eventually open up. 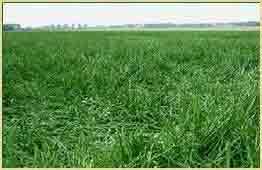 In general, we can say that the moment to harvest is when between 90 and 100% of the plants have wilted, but 50% of the leaves are still green (see the photo). Between the moment when the foliage starts to wilt and the moment of harvest, yields can increase by between 10 and 15%, depending mainly on the weather. The temperature must be moderate. Light intensity must not be too low or too high. A later harvest will yield more produce at a higher quality, but with greater risk, as it is susceptible to adverse weather conditions (dew and rain). Rain causes black spots to appear on the skin. The veins of the onions darken. 1. 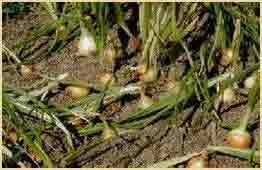 The onions can be harvested once 50% to 80% of the plants have a soft neck and the foliage has started to wilt. 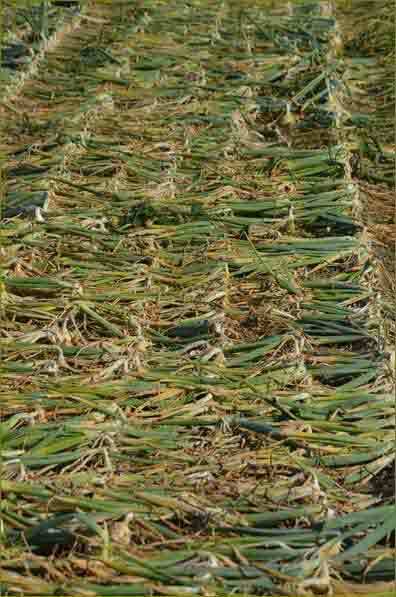 Ideally, onions should be harvested once the leaves have wilted between 90% and 100%. This means that we have a timeframe of about two weeks in which to harvest the onions. 2. The veins of the onions start to change from light green to a darker colour, which is brown or purple depending on the variety (see the photo to the right). Working out when the onions are ready to harvest is truly an art form, and one that requires great experience as well as knowing whether or not the onions are to be stored. The decision whether or not to store onions is debated over several pages on this website. An unripe onion should not be stored, because it will sprout in storage. On the other hand, well ripened onions, with more than 90% of the plant wilted, can be stored with no risk of sprouting. See: How to store onions. However, other factors must be considered, as with everything in life, like the weather for example: if the forecast is really bad, it is better to the move the harvest to somewhere safe than leave it in the field. Another danger of leaving onions to ripen completely is the risk of flowering. If this occurs, then the centre of the bulb will go dark and hard. 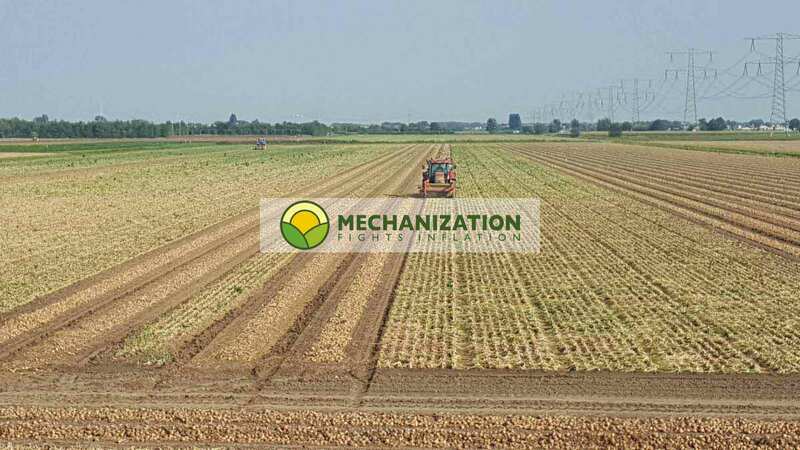 In short: determining the right time to harvest onions is an art that should be left to the professionals with lots of experience in this area.